This video originally appeared on News OK. This story originally appeared on News OK. View the original story here. Somewhere in the middle of the tailgate or potluck, someone scoops a chip into a bowl of homemade salsa, takes a bite and proclaims, "That's the best salsa I've ever tasted. It ought to be on grocery store shelves!" Whether it's salsa, barbecue sauce or homemade jelly, everyone knows someone with dreams of going from homemade to market-ready. What may be news to many is that there is a program funded by their tax dollars at Oklahoma State University tasked with making those dreams come true. Two decades ago, the Robert S. Kerr Food and Agricultural Product Center (FAPC) opened in Stillwater where it has helped thousands of Oklahomans determine the viability of their ideas through workshops, testing venues, scientific research and a team of food-industry professionals to help determine whether to move forward or go back to the drawing board. For the past two years, The Oklahoman has documented the progress of four products and the people behind them, struggling to make it to market and stay there. After Jim Mashore's wife Diane and daughter Brooke Franklin completed their first trade show five years ago selling Diane's Legendary Italian Dressing, spirits were high in their Edmond home. But Jim wanted to make sure they didn't take the moment for granted. Jim Mashore was diagnosed with prostate cancer in 2000, providing tragic inspiration for his wife and daughter's entrepreneurship. With the cancer in and out of remission, it took another six years before the Mashores began in earnest building a business. It was Brooke who suggested they might find a market for the Italian salad dressing Diane was famous for among family and friends. Jim would act as sales manager as long as his health would allow. Today, Diane's Signature Foods includes Signature Dressing for Salad in Legendary Italian and Hatch Chile Valley labels. The gourmet products are available from Oklahoma City to Dallas. In July, Brooke said, "I guess it was a few months ago, I was looking back over the books and making projections and I realized, 'This is really working, we might just be OK.'"
That unassailable occasion for celebration, according to her dad's earlier dictum on top of the 10-year anniversary of their business, came in November and went to measured celebration for good reason. Jim Mashore died September 9. He was 76. As the new year arrived, Mashore's wife and daughter returned to the duties they swore they would carry on after he was gone. And the time for Diane's dressings to deliver on the promise his family believed in is nigh. After Michael Clark graduated from the University of Missouri, he took a good job with JPMorgan Chase, bound for a lucrative career in the world of high finance. Then he met Karlin Williamson. The two volunteered at MetroTech together, intending to inspire ambition in groups of kids coming out of juvenile detention. Their infectious enthusiasm helped double interest before funding ran dry. Unable to find financial support to sustain the program, Clark and Williamson devised a two-pronged plan to make their own. Karlin has a background in music production and Michael is a dynamic singer, but to record takes money they didn't have. So they turned to the kitchen. "My wife is from the South, and people from the South are serious about their tea," Williamson explained. So he worked on a recipe under her tutelage, and the result inspired them to build a business around it. "We prayed on it before, and the Lord delivered this iced tea," Williamson said. "We're going to use the money we make from the tea to help with the music part, then we'll be making money two ways to support the mentoring." Clark said, "Faith is really important to what we do. I came from the financial world, I lived that life. What we're doing is more like a mission." Clark explained their business model isn't based on creating wealth that will some day grow large enough so they can chip off a little for charity. "We're creating businesses to support our mission, 100 percent," he said. The Ice T Kings first attended Basic Training in October of 2014. Since then, the FAPC has connected them with potential co-packers from in and out of Oklahoma to no avail. So Ice T Kings recently leased space to do their own production. But first, they need equipment. Susan Witt has never claimed to be a gourmet cook, but for most of her adult life her salsa recipe was the toast of potlucks and watch-parties. She and her husband, Bruce, are second-generation owners of Del City's Rosebud Cleaners, which along with raising children, taking care of grandchildren and volunteering has kept Susan plenty busy. About 20 years ago, she prepared her salsa for a watch party attended by Jim Brooks, who had recently sold his shares in a local food-packing company to go to work at the new FAPC at OSU. "The first time I tried Susan's salsa was at a Super Bowl party," he said. "I didn't know who'd made it, but it was so good when I went back to get more, it was the only salsa that had run out." Brooks was adamant Witt come to Basic Training, which she did — 16 years later. "Believe it or not, I didn't forget about it over all that time," she laughed. "My husband owns a dry cleaner and we had children and grandchildren to take care of, so I spent my time thinking about a name and a slogan and fantasized about seeing it on shelves. It finally happened in 2012, and now Witt is concentrating on new markets. Last August, she met with the high school pom squad at Choctaw High School, pitching her product to them to raise money to no avail, but she did find partners at her alma mater, Del City High School, where the Special Eagles were in crisis seeking funds to attend the Special Olympics. "Since school activity funding was impacted this year with the budget crunch, the need for fundraising was more important than ever," she said. Ace in the Bowl helped raise $700 in two weeks. If there is a shepherd among the group, it is Suan Grant. Like Diane Mashore, Grant's entrepreneurship came out of necessity. Her husband Jackie's battle with Alzheimer's disease ended in 2006, leaving a heavy burden. "Alzheimer's disease depleted our assets just as it had depleted his memories," she said. "I needed a job and no one would hire a woman my age who had not worked in the past 30 years and had no advanced computer skills nor any interest in gaining any. Years of volunteer work does not necessarily transfer into wanted/needed job skills." So the former hospital records professional, turned to the place she'd lived and found love from 1974 to 1978. "I had two choices: Barbados or Jamaica. I chose Jamaica," she said. It was there she met and married Jackie and picked up on the local flavor that would inspire Suan's Jelly. "It's a Scotch Bonnet Pepper Jelly — it's a Jamaican pepper in the family of the habanero," Grant said. "They flavor almost everything they eat with Scotch bonnet peppers, which is unique. It's a very hot pepper — one of the hottest peppers there are. I tame the heat and yet keep the wonderful flavors of the Scotch bonnet pepper. It has a kick to it, but it doesn't burn." Reaching for wisdom life's travels had tucked in a safe place until she needed it, Grant began whipping up batches of Scotch Bonnet jelly. Today, she offers a line of seven products that are sold worldwide. "I went to Germany last year (as part of a program organized by the Made in Oklahoma Coalition), and met some people from Czechoslovakia who said they just loved the jelly," Grant said. "To connect with people from another continent because of my jelly was just so special." But don't be fooled, Grant isn't seeing Smucker's money. At 73 going on 17, she hustles around the state to promote her products at grocery stores, trade shows and special events, but she's rarely too busy to help colleagues. “We always run everything past Suan," Diane Mashore said. ”She's always been so honest with us." Grant is chair of the Emerging Businesses committee, which convened at the Department of Agriculture in August to hear a presentation by a contingent from Valliance Bank extolling the virtues of community banking. She beamed through the presentation led by her granddaughter Lexi. But the subject the dozen or so members on hand were most eager to discuss was a new opportunity with Associated Wholesale Grocers, one of the largest food distributors in the region. AWG offered to allow Made in Oklahoma Coalition members an exclusive display from which to market their products. Suan's Foods, Diane's Signature Foods and Ace in the Bowl are all members. "AWG is bending over backwards to help on this project," Brooks said. "It's such an incredible opportunity," Grant said last summer. "Having all our products grouped together under the banner of Made in Oklahoma, it's just got to work." As she walked out the door, she muttered, "it better" through her ever-present smile, a hint of anxiety in her tone. This story originally appeared on News OK. See original story here. STILLWATER — When the 96,000-square-foot Robert S. Kerr Food & Agricultural Products Center opened in 1997, its mission was to support Oklahoma industries and cultivate entrepreneurship. Inside the building at 320 N Monroe Ave., industry professionals and scientists work side by side, offering animal harvesting, food manufacturing, grain-milling, sensory profiling, food microbiology, analytical and application laboratories for demonstration and prototype testing. Since its inception, the center has assisted more than 1,000 Oklahoma clients through 3,000 technical and business projects discover, develop and deliver data to develop value-added food and agricultural products and processing in Oklahoma. But the partnership between private and public sectors didn't come easy. "This all dates back to the 1960s and 1970s when there grew an outcry from the agriculture community for conversion in-state," said Dr. J. Roy Escoubas, director of the FAPC since 2002. "Things grown here were being shipped back from out-of-state conversion plants and sold to Oklahoma consumers at a premium," said Escoubas, who came to the FAPC after 25 years in the food-packing business. One of the folks most concerned with the paradox was an entrepreneurial farmer out of Altus named Bob Kerr. He was concerned enough he decided to run for state senate in 1986 and won. It took the next decade to get the bill fashioned and turned down "two or three times" according to Jim Brooks, manager of business and marketing services for the FAPC, before passing the governor's desk. Escoubas concurred, "I talked to Bob Kerr many times over the years, and he always said, 'Whatever you do, keep that thing focused on the industry.' I knew what he meant, he didn't mean to keep academia out, he wanted to make sure there was always a good balance between industry and research." Long before ground was broken in 1994, organizers visited Texas A&M and the University of Nebraska to observe comparable programs. "We needed to develop a center for economic development and product development based on academic research and application of business technology," Escoubas said. "None of the schools we visited had anything quite like it. But we learned a lot, particularly from the University of Nebraska." Escoubas said other programs were weighted more toward research, which helped Kerr and his team fashion a center that would have more practical entry points for the agriculture industry, which created more experiential practicum for students. "By the time Kerr's bill was voted on, it had consensus support throughout the Legislature," Escoubas said. The center bearing the late senator's name opened Jan. 1, 1997. "Bob Kerr was one of those guys that everyone loved and respected," Escoubas said. "He had ethics and it earned him the respect of everyone." Escoubas said Kerr's goals have been generally accomplished as the center continues to partner with industry, cultivate clients and harvest good students. Among the many clients cultivated are the four entrepreneurs The Oklahoman started tracking in 2014. Suan Grant, founder and owner of Suan Foods, attended the Basic Training Entrepreneurial Workshop in 2009. "I had been making my jelly for decades and everyone told me I needed to bottle it and sell it, but I didn't know how," Grant said. "I had called the OSU's Extension Office here in Oklahoma City to see how to get my jelly in the Farmers Market and was immediately referred to the FAPC." She said she learned if she was interested in selling her products, she needed to first attend the one-day workshop. "They are very honest and frank with you," Grant said. "They encourage you; they take you by the hand and lead you through the process." The all-day seminar is a crash course in business operations with an emphasis on food and beverage products, including food manufacturing, health department regulations, marketing, distribution, labeling, patent and trademark, branding, processing, co-packing, and the Made in Oklahoma Coalition. Brooks said Basic Training is intended to be both a way forward for some and a signal to go back to the drawing board for others. "Part of the reason we're so thorough is we want don't want to set people up to fail by telling them how easy it is, because it's not," Brooks said. "To be successful, you have to accept that it's going to a lot of hard work." The class ends with a Client Success Path section that culminates with attendees filling out a sample business plan. "It's only one day but it is packed," Susan Witt of Ace in the Bowl Salsa said. "I had the name, I had the recipe, I had the slogan, I just didn't have the package. Even though I had all that, it was still a little scary." Witt's first step to deciding whether to move forward came on the internet. "So when I got home from Basic Training, I took a deep breath and Googled 'ace in the bowl,'" she explained. "And it had a hit. "My heart just sank. So I clicked on the link, figured I might as well see what it is and then I just burst out laughing — it was a plumber up in Oregon who specialized in toilets." "I don't know how we would still be in business without the FAPC," Brooke Franklin of Diane's Signature Dressings for Salad said. "The Basic Training opened our eyes to a lot of things we hadn't thought of." The most recent attendees from our group were Karlin Williamson and Michael Clark of Ice T Kings, who said the class bolstered their resolve. "We had a lot to learn," Clark said of their experience in 2014. "It was an incredible amount of information. It set us on the right path." From Suan's Foods to Ice T Kings and many others in between who found the class to be the way forward, the real work begins after its over. Brooks and a team of staff with a variety of areas of expertise then make an assessment of the product. "When we first sampled the tea from the Ice T Kings, our recommendation was that they cut back on the sweetness," Brooks said. "So they went back to their kitchen and worked on it and the next time we tasted it, it was really good and everyone agreed we were ready to move forward." With a proper business plan and the product reviewed to satisfaction, clients are then handed a pilot plan. At the top of the list of tasks to check off that pilot plan is product scale-up — to ensure the recipes hold up to batch production. Sounds simple, but it took one of our subjects two years to get to that point. When Making it to Market continues, clients discuss their experiences during the scale-up of their products. This story originally appeared on News OK. View here. One year ago Thursday, Diane Mashore and her daughter Brooke Franklin met at the Robert S. Kerr Food and Agricultural Center with Dr. Darren Scott, with bacon on their minds. Together they own and operate Diane's Signature Dressings for Salad and are one of four groups The Oklahoman has tracked the past two years to document the progress of their food products. Franklin lives with her family in Dallas, where she's cultivated a thriving relationship between her company's dressings and Texas grocery giant Central Market. She and her mother had pitched a bacon dressing to Central Market, but the feedback was that it needed more bacon flavor. As FAPC clients, they were able to enlist the help of Scott, who is a food scientist who was capable of navigating Mashore and Franklin through a series of painstaking tests to work out problems of temperature and texture for mass production. Mashore showed Scott a manila folder filled with notes written in red of their many attempts to find the perfect blend before Scott began tapping on an old-fashioned calculator. He jotted his calculations on a yellow pad, converting their measurements into weights for efficiency. They took a selfie for posterity, just as they've done each time they've come up for testing, which can not only be tedious but require multiple sessions. The first taste-test results were good, but it still needed a little stronger bacon flavor. For the second test, Scott warmed the dressing, which changed things for the worse. "It got pretty bland," Franklin remarked. Bacon salt turned it red, real bacon pieces didn't impart flavor as boldly as bits, and on it went through the day. A full day spent in testing resulted in a major decision: bacon dressing went on hold. By July, Mashore and Franklin had all but abandoned the idea, concluding it would be more trouble to continue testing than it was worth. In the case of Diane's Signature Dressings, the secret has always been premium ingredients. The Legendary Italian Dressing took years to develop. One dressing they did decide to add was the Hatch Chile Valley dressing, which has been a well-received addition. The new product is especially good for recipes. We've got a pasta salad recipe you won't want to miss, but either dressing works very well as a simple glaze for fish or marinade for chicken. Susan Witt's Ace in the Bowl Salsa has settled on three flavors, which has suited her well enough. Despite being known by her family as the kitchen klutz, Witt is the only person on either side of her clan who has a food product on the shelves of grocery stores. "I wasn't a great cook so I decided to concentrate on making one thing as best as I could," Witt explained with a laugh. "I wanted to make my salsa different from anyone else's so I got the idea to use olive oil and all fresh ingredients." Many who taste it for the first time can't put their finger on what it is that makes it stand out, and Witt said a lot of times customers don't believe her. The salsa comes in three levels of heat: mild (the original), medium and hot, which includes habanero peppers. Because of its unique ingredient list, Ace in the Bowl is more versatile than the average salsa. Suan Grant found her entrepreneurial spirit animal in Jamaica — the Scotch Bonnet pepper. Scotch Bonnets are a close cousin to the slightly fierier habanero, but Grant goes to great pains to ensure her jellies don't overwhelm you with heat. Her jellies sell worldwide, and it doesn't take much more than a single bite to understand why. The jelly is simply amazing in that it not only works as a spread but might be even better as a cooking ingredient. What started out as one heavenly product has grown into a line of seven. Besides the original jelly, she now offers a Scotch Bonnet Flavor Sauce and Scotch Bonnet Relish. But to prove she was more than a purveyor of peppers, Grant added a Mango Lemon Fruit Butter, Sweet Tomato Jam, Pineapple Cinnamon Jam and Onion Preserves. Like her original jelly, each of these products provides rare versatility. A dollop of Sweet Tomato Jam sneaked into a wok of stir-frying beef, chicken or pork infuses it with a subtle acidic sweetness impossible to match with anything else I've tried. Here are some recipes using the products from our subjects. Heat oven to 350 F. Cook pasta according to directions. Drain and set aside. Cook bacon until crispy, cool, and chop. Set aside. Melt butter in a saucepan over medium heat. Add flour and stir until liquid is absorbed and roux begins to form. Add milk and half and half and stir continuously. Bring to a boil and cook until liquid is thick and smooth. Remove from heat and add cream cheese, Monterrey Jack, cheddar, and salt and pepper. Stir until cheese is completely melted into the liquid. In a large bowl, combine pasta with cheese sauce. Fold in bacon and salsa. Pour into a buttered baking dish. Top with jalapeno slices and breadcrumbs. Bake for 45-60 minutes or until golden brown and cheese is bubbly, enjoy! Peel pears without removing stems, placing in a deep saucepan. In saucepan of melted Suan's Scotch Bonnet Pepper Jelly, add wine, lemon juice, sugar, cinnamon, lemon zest, vanilla bean and enough water to cover pears, pour over pears and simmer very slowly until just tender 10 to 20 minutes. Remove pears carefully to a serving dish, rapidly boil down liquid to about 1 cup, pour over pears and serve cool to cold topped with whipped cream. These pears will be spicy; you may reduce the “heat” by reducing the jelly in half or increase the “heat” by the amount of jelly used. Cook pasta according to directions on the box, drain will and transfer to a mixing bowl. Add remaining ingredients and mix well. It can be served warm, room temperature or cold. You may also cook the pasta in advance, combine with a tablespoon of olive oil and refrigerate so you can chop the vegetables and serve later. This SUNUP segment showcases Made in Oklahoma month with a feature on how Suan worked with Andrea Graves of the Robert M. Kerr Food and Agricultural Product Center to develop her signature scotch bonnet pepper jelly. 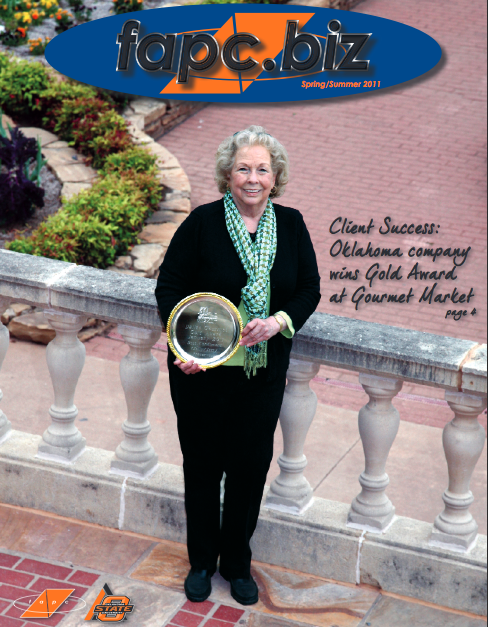 Suan's® Foods and Robin Wolf Pottery were featured as the cover story for the Fall 2011 issue of Oklahoma Country magazine. Read here. When the need arose to fund an opportunity for Oklahoma food entrepreneurs with the promotion and marketing of their products, David Howard, founder and chief innovator of Unitherm Food Systems of Bristow, Okla., stepped forward with a one-time gift of almost $9,500. Unitherm’s monetary contribution, as well as additional support by the Made in Oklahoma program, helped create Oklahoma Gourmet, a newly formed group representing clients of Oklahoma State University’s Robert M. Kerr Food & Agricultural Products Center (FAPC), at The Gourmet Market in Dallas, Texas. The Gourmet Market hosts three large food shows a year inviting retailers to the Dallas Market Center. The Oklahoma Gourmet booth features three FAPC entrepreneurial clients in the space purchased with Howard’s gift. “The funding provided by Mr. Howard helped the FAPC develop a new program to assist our entrepreneurial clients in spite of the current budgets cuts and enabled start-up companies to participate in The Gourmet Market at a reduced price,” Graves said. The Gourmet Market is a 25,000-square-foot shared showroom with unique gourmet and specialty food lines as well as housewares, cookware, tabletop, kitchen gadgets and wine accessories from more than 150 companies representing some of the biggest names in the industry as well as up-and-coming individual entrepreneurs. The Gourmet Market is just one of the many categories of the Dallas Market Center, which is known as the world’s most complete wholesale marketplace. The Dallas Market Center holds 50-plus markets each year attended by more than 200,000 buyers from across the globe. Launching a food product into the vast, diverse and competitive market is not the easiest thing to do, Howard said. Any opportunity to create an avenue to get the product in front of buyers is beneficial. As a member of the FAPC Industry Advisory Committee, Howard saw value in displaying Oklahoma food products at the Dallas Market Center. Howard is known as an industry leader with an innovative mindset in the creation and design of machines and systems. He believes safety, efficiency and innovation has allowed Unitherm to be competitive in developing food processes. Howard founded Unitherm in the United Kingdom in 1985, but relocated the business to the United States in 1995. Since the company’s inception more than 25 years ago, Unitherm has introduced the smoking process for 80 percent of all smoked turkey sold, launched numerous ready meal processes, and cooked everything from pasta to chicken and jerky to peppers. Howard said providing opportunities such as display space at The Gourmet Market helps young companies with exposure of their products. Factors of difficult economic times and increased market share of large companies often halt the growth of small businesses. Oklahoma Gourmet featured clients for 2011 include the Twisted Chile of Tulsa, Okla.; Ziegelmeier Toasted Pecan Butter of Ada, Okla.; and Suan’s Scotch Bonnet Pepper Jelly of Oklahoma City, Okla.
Graves said these companies retail their products throughout Oklahoma, but the goal is to get these clients to the next level of marketing, selling and distributing. As a result of her exposure at The Gourmet Market, Suan’s Foods won the coveted Gourmet Gold Award for her scotch bonnet pepper jelly, which helped lead to national recognition as Editor’s Choice in the Fancy Food magazine. Howard said the success of the clients would determine if Oklahoma Gourmet is permanent. He hopes the purchased booth space continues in upcoming years. “Success in the Dallas Gourmet Market is good for the entrepreneurs and also good for Oklahoma,” Howard said. Howard encourages companies not linked with the FAPC and needs help to contact the center to discover how they can help to grow their business. For more information about Oklahoma Gourmet or the FAPC, visit www.fapc.biz, or contact the center at 405-744-6071 or e-mailing fapc@okstate.edu. Suan's® Foods was featured as the cover story for the Spring/Summer 2011 issue of fapc.biz magazine. Read here. (Stillwater, Okla. – March 4, 2011) An Oklahoma business and client of Oklahoma State University’s Robert M. Kerr Food & Agricultural Products Center took home the coveted Gourmet Gold Award during The Gourmet Market in Dallas, Texas. Suan Grant, owner of Suan’s Foods, surpassed the competition in the Best Condiment: Jelly/Jams/Preserves category with her scotch bonnet pepper jelly in the areas of taste, originality and packaging during the January gourmet food exhibition. Grant became fond of cooking with scotch bonnet pepper jelly while living in Jamaica. The Oklahoma City company has produced the prized condiment since 2009. “For many years, I have been making the jelly for family and friends, but it was not until 2009 that I decided to bottle and sell it,” Grant said. In search of assistance with her new venture, Grant contacted her local extension office, which referred her to the FAPC Basic Training workshop for food business entrepreneurs. “The best thing I could have done was participate in the FAPC seminar,” Grant said. “I attribute Suan’s success today to taking that course and the support of the FAPC. The FAPC has assisted Grant with scale-up, sensory testing, cost evaluations, shelf-life studies, product placement, and media and promotion of her product. and sold nationally through Internet sales. Grant featured her products in the Oklahoma Gourmet booth along with other FAPC clients The Twisted Chile of Tulsa, Okla., and Ziegelmeier Toasted Pecan Butter of Ada, Okla.
recognition as Editor’s Choice in the prestigious Fancy Food & Culinary Products magazine. For more information about Suan’s Scotch Bonnet Pepper Jelly, Oklahoma Gourmet or services offered at the FAPC, visit www.fapc.biz, call the center at 405-744-6071 or e-mail fapc@okstate.edu. NORMAN — Suan’s Scotch Bonnet Pepper Jelly, a Made in Oklahoma company, was a winner in the second annual Dallas Gourmet Gold Awards at The Gourmet Market in Dallas. Suan’s won the Gold Award for best jelly, jam or preserves at this year’s show. The company, owned by Suan Grant, exhibited at the show for the first time this year. Three MIO companies had the opportunity to exhibit at The Gourmet Market through the Oklahoma Gourmet project, a partnership between the Robert M. Kerr Food and Agricultural Products Center and the MIO Program. Along with Suan’s Scotch Bonnet Pepper Jelly, of Oklahoma City, The Twisted Chile, of Tulsa, and Ziegelmeier Toasted Pecan Butter, of Ada, exhibited at the show. The Gourmet Market serves as a showcase for the newest gourmet foods. Oklahoma Gourmet purchased one year of booth space at The Gourmet Market to feature clients and their products. The goal was to get MIO companies to the next level of marketing, selling and distribution. “The Dallas Gourmet Market is a great opportunity for Oklahoma companies to be introduced to national and international buyers,” said Julie Fitzgerald, MIO marketing coordinator. To learn more about the Gourmet Market visit www.dallasmarketcenter.com. Visit Suan’s website at www.suansfoods.com or find more MIO products at www.madeinoklahoma.net.